This one is for all of my vision impaired friends! I've been dying to find cute glasses that don't break the bank. I have astigmatism and I've had it for about 12 years now. Having astigmatism makes it challenging for me to choose between contacts or glasses. I usually wear my contacts 90% of the time BUT when I do wear glasses I don't want to look like someone's grandma! I think I found a solution. Zenni's! Check out my review below! Don't have time to watch, I'll give you a quick run down. Zenni Optical offer a wide range of prescription glasses from children's, men, and women all at affordable prices. 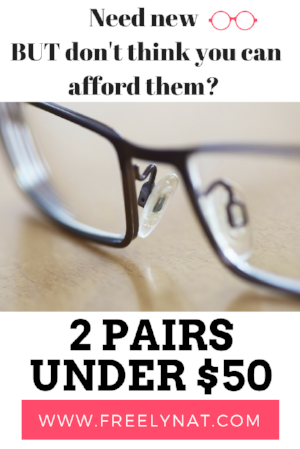 I've seen glasses as low as $8!!! Yes they are REAL. Everyone loves to ask me can you see out of them and the answer is YES! I took my prescription from my doctor and typed it in. Pretty simple. The glasses can go up in price if you choose to add the extra stuff. I don't need the extras. I don't wear my glasses enough to want all of the bells and whistles. I was able to score two pairs of glasses for under $50 and I even convinced my mom to get some and she now owns 3 pairs!!! I will warn you it does take about 2-3 weeks to receive your glasses but at that price, I'm not complaining! !